I knew as soon as I was done writing my review of Daredevil #22 that I would have to go back and write about it some more. I don’t like to give away the ending of an issue so I had to leave out Foggy’s shocking reveal (if you still haven’t read the issue, stop reading now!) from the review despite the fact that it felt like something I/we/”Daredevil fandom” really needed to talk about. There were other things as well that I wanted to give some extra attention to that I didn’t feel were within the scope of a review. Wow. This is about as real-world as it can get. Of course, many real medical conditions present a problem when dealt with against the backdrop of the Marvel Universe for the simple reason that the readers know that geniuses and inventions (and magic!) exist in that world that should make many ailments a thing of the past. On the other hand, I think this is something you have to overlook in order to be able to enjoy stories that are more down to Earth. This is especially true of a title like Daredevil where the main character’s impairment goes unfixed while some of his fellow heroes are sporting spare parts that are better than the real thing (I’m looking at you, Misty Knight). My guess is that Foggy’s cancer will not be treated by Doctor Strange, nor is it likely to be some kind of illusion or spell (remember when Karen Page had AIDS? ), for the simple reason that I think Mark Waid is a much better writer than that. I am also quite certain that Foggy will not actually die. Maybe I should be more worried than I am and might end up having to eat my words in a few months time, but I just can’t see that happening. Not because characters don’t die in comics all the time (and those without superpowers even tend to stay dead), but because it has happened so often around Matt Murdock that it would seem cliché to do it again. There’s also the fact that because so many characters close to Matt have died over the years, there’s really only Foggy left. Daredevil doesn’t have a large supporting cast. Excluding other superheroes and acquaintances who have come and gone over the years, Foggy Nelson is the supporting cast. What I expect out of this development, though, is some character growth and exploration for both of these guys. Aside from that, I don’t think there’s been much to indicate that anything would be wrong with Foggy. Except, of course, his extreme anger in dealing with Matt and his problems. The fact that we now know that Foggy has had his own fears to deal with does let Waid off the hook for Foggy’s strange behavior lately. Another thing that many people have pointed out is how great the Matt and Foggy scene leading up to this reveal is. Mark Waid presents us with a very sound and compelling reason for why Matt would have hidden his abilities for all those years before he even put on the Daredevil costume. This explanation pretty much boils down to his need for the empowerment that having a secret could provide at a time when he struggled with how others perceived him. This makes a ton of sense to me, and I really appreciate that Mark Waid is so in tune with this character that he is able to explore all of Daredevil’s behaviors and motivations and give them meaning. This brings us to the beginning of the book and the revolutionary move to showcase Matt having a, let’s call it a blind moment. I mentioned in my review that I very much enjoyed and appreciated this decision on Waid’s part. And, the fact that Chris Samnee seemingly put a lot of effort and research into those first couple of beautiful pages is icing on the cake. What I’m also excited to see is how many other people, in their own reviews or message board comments, also seemed to appreciate this scene. 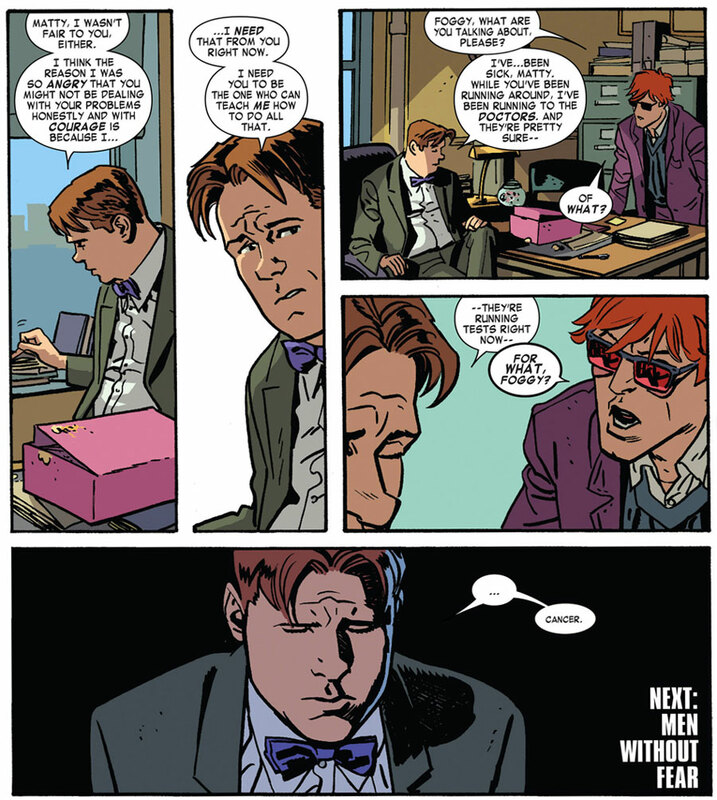 While I’m guilty of more or less lobbying for this kind of treatment of the character for years, it’s nice to see it so well-received by readers who may not even have thought about Matt Murdock in this light before. Speaking of this first scene, I did want to take a closer look at the topic of smartphones and cool apps for the blind, but I think that might be best served by a separate post. Now, how do you guys feel about that last page reveal in particular? Many have commented on my initial review (thank you! ), but feel free to discuss it in further detail, spoilers and all, right here! First, about the money: Don’t forget that in the movie, Matt had his paper money at home in plastic containers with braille to identify which bills were in each container, and we saw him folding the bills to note which was which. As for Foggy as THE supporting character, you couldn’t be more right about that. So many people have come into and gone out of Matt’s life over the years, yet Foggy has remained the one constant. He’s been comedy relief, he’s been keen legal mind — he’s been a district attorney, for goodness sake! I sincerely hope that Mark and Chris will take Foggy and Matt (and us) on a journey that will have a happy ending. Neither of them have had a lot of those lately. @Steven: You are right on the money about the money (aren’t I witty?)! I’ve seen quite a few people speak out in favor of that scene as well (even one or two who hated every other thing about the movie). I suspect that superhero movies are viewed as enough of a separate entity from the comics that this kind of new take on an old power is both permissible and encouraged. I think the scene from the movie is great, but am even more stoked to see something like that in the comic where continuity and old “truths” are a little harder for a writer to challenge. Here, Waid does it in the best possible way by pointing out that it’s not Matt’s abilities that have changed, but their practical usefulness in light of new technology. 1) How will it challenge Matt to be facing a crisis for which his Daredevil identity is useless? This is 100% a situation for Matt, the friend and law partner, not his alter ego. 2) How will Matt deal with having to take on a greater responsibility for the firm in Foggy’s presumed absence while undergoing treatment? It’s always been the assumption that Matt, with all of his extra-curricular activities, probably doesn’t take much responsibility for the practical details of running a business. It seems like Foggy has handled almost all of that, perhaps in part because being able to see probably makes certain types of paper work a little easier than it would be on Matt. One other way to show Matt’s disabled is to put him in a purple suit. As you point out Foggy is essential to the series. I think that a good wat to treat this would be dealing with cancer, and it s uncertanties, having Foggy s health deteriorate , until he can get a remission, crossing the fingers for the next time he might get another tumor. I wouldn t like magical solutions or cures, and think that Waid will deal with this issue apropiately. What Matt does to support Foggy is crucial, this is the real heroism I expect from him. @Dan: Yeah, the real question is why Matt’s not the one who’s got cancer? Though I suppose if he was going to get some scary tumors in his eyes or brain, that would have happened already. This is a very sobering topic, but one I’m glad to see Waid incorporate. For years, Foggy has served as the emotional center for Matt, the one true friend that Matt can rely on in spite of all the trials and troubles that being DD bring him. But now the role is reversed, Foggy is asking for Matt’s help, for his strength to face this new uncertainity and fear. I think it’s an interesting new view on their existing friendship. The second question is, this is the MU, so will Matt call upon any of the superhero community for help? Will Hank Pym show up with a super cure? Actually I hope this doesn’t happen. I think Waid deserves credit for broaching the subject but I think having a superhero cure would be something of a cop-out. 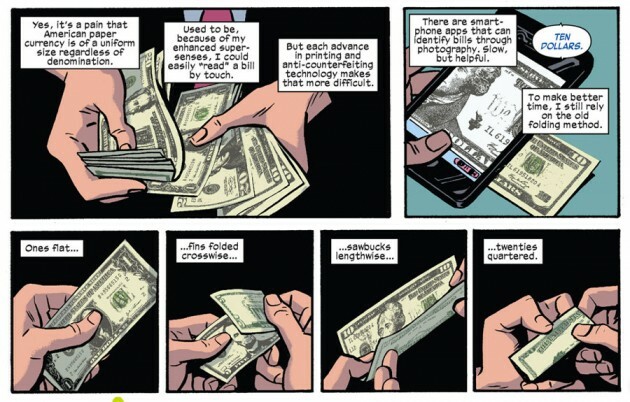 Throughout his run, Waid has been treating blindness with credibility and honesty (as witnessed by the money scene) so here’s to hoping he treats this subject with the same level of respect. Just picked up this issue. I *love* the money part. 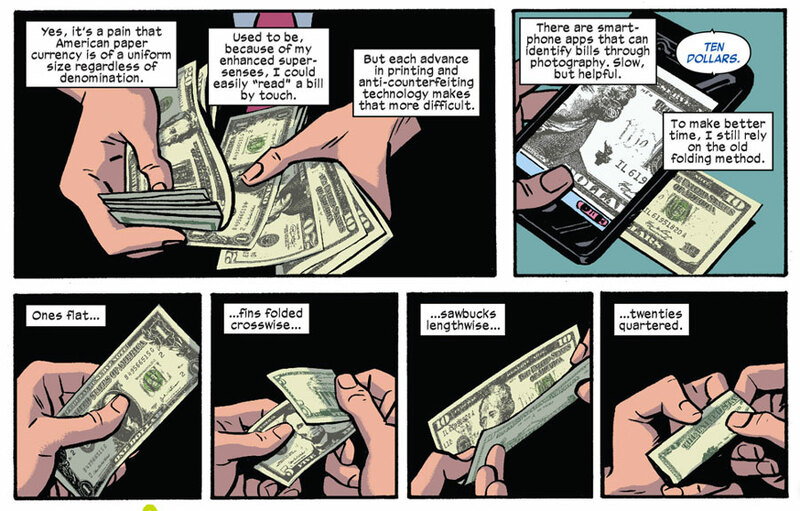 I love the attention to detail Waid and Co. have been showing. Wonderful issue. Waid’s run has had it ups and downs for me. Started absurdly strong but the became kind of tepid, then boring with the overly drawn out “omega drive” story with its crossover that didn’t progress the story at all. The last several issues since he got back from Latveria have been amazing though. I have conflicted thoughts on the cancer issue. This is a problem for me with comic books in general and not with what Mr. Waid will or won’t do with his story. Too many times comic writers try to have it both ways. Ultra “realistic” stories or outcomes when its convenient and more “sci-fi or magic” fixes when convenient. To me it might come off awkward and insincere to have this drama over Foggy’s illness when just a few issues ago Matt was infected from Latveria and a quick trip to see Tony, Hank, and Reed and he was better in an afternoon. Its kind of like when Milla was driven crazy with a chemical made by Fear. The whole time I was thinking why the hell doesn’t Murdock call up Tony Stark, Hank Pym, Hank Mccoy, Reed Richards, Charles Xavier, or Stephen Strange? All of whom are guaranteed smarter that Fear. “One More Day” was total garbage but at least they had sense enough for Peter to exhaust all superhero routes to help May before he just gave up and made his stupid deal with the devil.